Our range of products include mixture machine and hydraulic mixture machine. 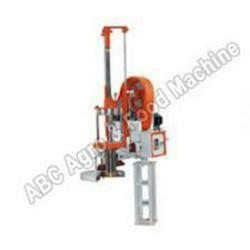 We are well known manufacturer and suppliers of the wide range of Mixture Machines. Made from finest quality raw materials and following international specifications, these are truly of world class standards. Our team of dedicated technicians along with quality department ensures that our customers get only the best product. Highly acknowledged for its attributes like durability, reliability and high performance, these are easy to operate and maintain and comes with capacity of 2Kg to 5Kg in one minute. We offer a wide assortment of Mixture Machine - Hydraulic. The product is fabricated from finest quality of raw materials to provide maximum durability and long service life. Used in various food industries, these are highly acknowledged for its specific design (can be changed with die plates), precision and standard performance. Our hi-tech hydraulic machines are available with capacity of 1Kg to 20Kg/ hr.